Happy Valley Organics is located in Whately, MA. 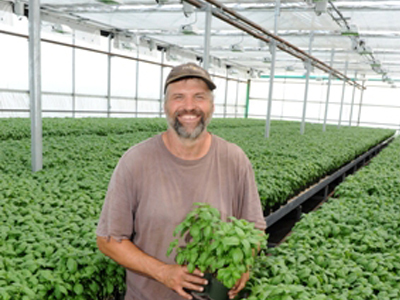 We work with Doug out at Happy Valley to get you potted basil and fresh cut herbs like rosemary, basil, oregano and chives! Happy Valley has a 103kw PV solar system mounted on 3 of their barns, providing a large portion of the power necessary to operate the energy efficient heating, lighting and watering systems in their greenhouses. Check out our short documentary video, which includes Doug from Happy Valley!